Your smile is important! It’s one of the first things you notice when you meet someone. Dr.Louie has remarkable skills. He has the ability to transform smiles such as this one showed here. Dr.Louie enhanced this patient’s smile with veneers and a teeth bleaching treatment. Veneers are used to help improve the look for teeth that are discolored, worn down, chipped, broken, misaligned, uneven, irregularly shaped, and teeth with small gaps. 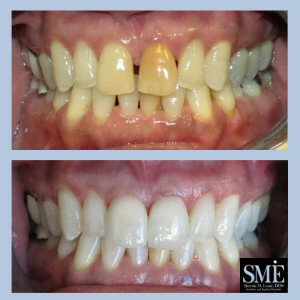 This veneer procedure helped cover any small gaps that showed, and the teeth bleaching left our patient with a beautiful pearly-white smile. Dr. Louie will make your experience a delightful and an affordable one. 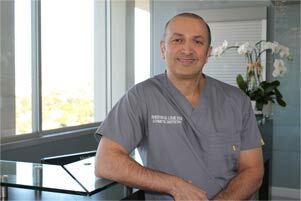 He has been able to transform the smiles of many patients leaving them with more self-esteem and confidence. Dr. Louie’s patients leave his office happy and satisfied with the results of their dental procedures. The difference in his before and afters is dramatic and designed to last. Contact our office to schedule an appointment with Dr. Louie and see how He can improve your smile like he did with the patient shown here. Our staff is happy to take your call and answer any questions you may have. We are happy to evaluate your smile and guide you through the treatment options available that best suit your specific situation.